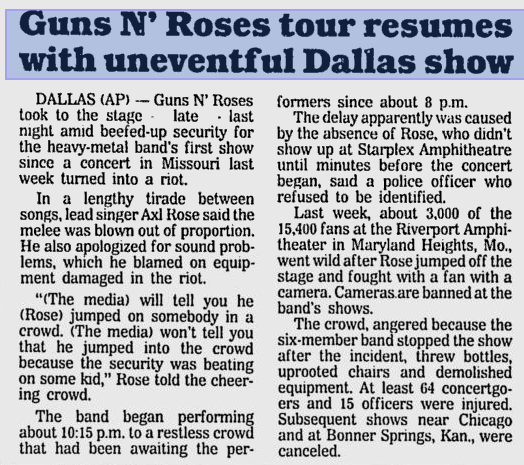 Dallas police had riot gear ready for the heavy-metal band Guns N' Roses' first show since fans rampaged at a Missouri concert, but all went smoothly once the performance started two hours late. The band performed Monday night for a near-capacity crowd at Dallas' 20,000-seat Starplex Ampitheatre. Lead singer Axl Rose arrived late, police said. Rose told fans that the melee last week was blown out of proportion by the media. He also apologized for sound problems, which he blamed on equipment damaged in the riot. Police Sgt. Jim Chandler said 41 off-duty officers, 10 more than usual, were hired to provide security. A private security firm provided additional guards, said Starplex general manager Larry Fontana. Last week, about 3,000 of the 15,400 fans at the Riverport Amphitheater in Maryland Heights, Mo., went wild after Rose jumped off the stage and then stopped the show. Angry fans threw bottles, uprooted chairs and demolished equipment. At least 64 concertgoers and 15 officers were injured. Subsequent shows near Chicago and at Bonner Springs were canceled. At Monday night's concert, Rose told the audience he had jumped into the crowd at the Missouri concert last week "because the security was beating on some kid." At the time, authorities and witnesses had said he had gone after a concertgoer who was toting a video camera; cameras are barred at the concert. The concert's promoters today said that Rose's claim wasn't true. 'If he says that security was beating up someone, he's the only person who saw it," said Steve Schankman, president of Contemporary Productions. Also Monday, a man injured in the melee filed a lawsuit in St. Louis Circuit Court, seeking unspecified damages from Rose, the concert's promoters and the builder of the amphitheatre. Guns N' Roses took to the stage - late - Monday night amid beefed-up security for the heavy-metal band's first show since a concert in Missouri last week turned into a riot. This one ended peacefully. In a lengthy tirade between songs, lead singer Axl Rose said the melee last week was blown out of proportion. "(The media) will tell you he (Rose) jumped on somebody in a crowd. (The media) won't tell you that he jumped into the crowd because the security was beating on some kid,'' Rose told the cheering crowd. The band began performing about 10:15 p.m. to a restless crowd that had been awaiting the performers since about 8 p.m. The concert ended less than two hours later. The delay apparently was caused by the absence of Rose, who didn't show up until minutes before the concert began, a police officer said. Last week, about 3,000 fans at the Riverport Amphitheater in Maryland Heights, Mo., went wild after Rose jumped off the stage and fought with a fan with a camera. The crowd, angered because the six-member band stopped the show after the incident, threw bottles, uprooted chairs and demolished equipment. At least 64 concertgoers and 15 officers were injured. Kwick1 wrote: I think the '91 Dallas show is unique. The show was immediately canceled after St Louis and then was back on. Dallas had a curfew of 11 pm. Skid Row took the stage at 6 and played their set and left the stage. They came back out and played more which should have been the first indication something was wrong. Skid Row eventually left the stage for good. Baz saying he was sunburnt. At some point, I remember it being announced that Axl wasn't there and many people left. I was a broke law student and this allowed me to move seats to the really good seats. About 2 1/2 hrs after Skid Row left the stage GnR came on and it was rocky at first whether Axl would stay. Someone threw something at him which he responded something like, he would leave if it continued or he would stay and put on a rockin' show. It ended up being a great show. But only about an hour because the curfew. my friends that stayed for the 2nd night show said the show started on time and was great playing for a couple of hours. I've always thought Axl didn't really want to be there but reading all the problems with sound, that must have had something to do with it since I don't think he or maybe any of them were even there until taking the stage. Two MTV reports based on a review by Robert Wilonsky in Dallas Times Herald (I couldn't find the original review). Kurt Loder: ... review in Dallas Time Herald, Guns N’ Roses arrived on stage two hours late, after a couple of hundred people had, in Wilonsky’s words, left in disgust at the delay. According to Wilonsky, Guns frontman Axl Rose’s first words to the audience were, “If you throw anything, we’re gone. You’ve got a problem with that?” A bit later, Rose reportedly apologized for the sound, blaming it on the damage the band’s sound equipment had sustained during the St. Louis riot, and launched a 15-minute diatribe against the media and its coverage of that incident, which he said was sapping the band’s energy. They helped kill Jim Morrison with a lot less pressure, Rose said. The group offered no encores, and Rose’s last words to the fans, more or less, were “Thank you Dallas, F.U. St. Louis and God Bless America”. As for the music Guns N’ Roses played in Dallas last night, according to pop critic Wilonsky, it was “incredible”. Loder: After a riot at a concert near St. Louis last week and two subsequently canceled shows, Guns N’ Roses resumed their US tour in Dallas on Monday night, with a vengeance. According to Dallas Times Herald music writer Robert Wilonsky, the band was two hours late in taking the stage – not a totally unprecedented occurrence – and was vocally unhappy with its riot-damaged sound equipment. Nevertheless, the playing was hot, frontman Axl Rose sang like a man possessed and, overall, the music, according to Wilonsky, was incredible. Rose also offered an extended diatribe against the media, which he said had distorted the facts of the St. Louis riot, and then a statement released on Wednesday contended that a gang of rowdy bikers, uncontrolled by concert security staffers, was hassling fans in front of the stage at that show, which is what prompted Rose to jump into the audience. Nevertheless, one fan at the St. Louis show, Jerome Harrison, who claims he suffered neck and head injuries during the melee, filed his lawsuit this week against Axl Rose, various Guns N’ Roses roadies and local promoters and venue officials, charging among other things that security at the show had been inadequate, an assessment in which he was joined by Guns N’ Roses themselves. Unfazed by these assertions, the promoters of the St. Louis concert filed their own suit against Guns N’ Roses on Wednesday, charging that the group had violated its contractual agreement to refrain from conduct that knew would be provocative and dangerous to members of the audience.